Copyright : This item is reproduced courtesy of John Angove and Wytt Morro. It may be printed or saved for personal research or study. Use for any other purpose requires written permission from John Angove and Wytt Morro and the State Library of South Australia. To request approval, complete the Permission to publish form. Bulk wine sold in flagons was subject to spoiling once opened, so several Australian wine companies began developing a wine dispenser cask. In 1965, Tom Angove patented the 'improved container and pack for liquids' and Angove's became the first company to market the wine cask, sometimes known as the 'bag-in-a-box'. 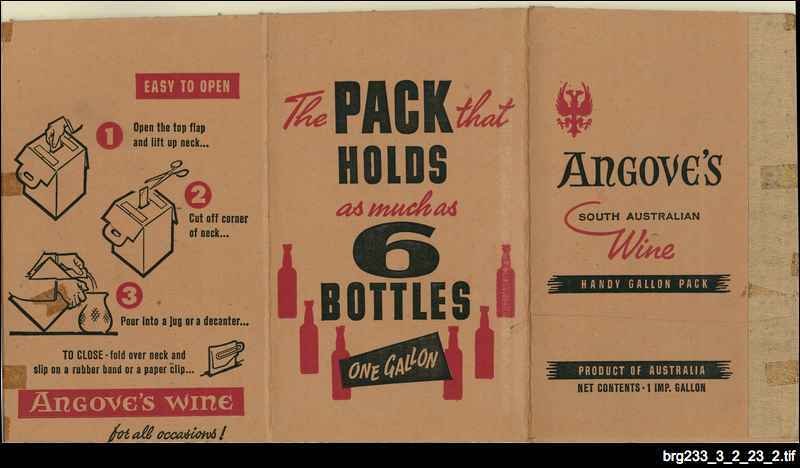 Angoves 'handy gallon pack' wine cask features graphics designed by well-known South Australian designer Wytt Morro.